You will notice that Davey has decided that he really wants to earn that 6th consecutive win by resting both Werth and Morse on the same day. the old "two guys in left, none in right" defense. Interesting. morse is slumping, werth is hurting. FWIW, this is stanton's 2nd day back after hurting his hammy, he was 0-3 last night. For those going tonight: Capital Weather Gang NatCast has 'It's been a while since we have needed to dress in layers – but now is the time! Our bodies won't be used to the cool breeze and temperatures by game's end perhaps as cool as upper 50s! With the sun setting earlier, it won't help keep you warm either!' with 5% chance of rain. I have a quick question, and I apologize if it's slightly off-topic. I was actually at the game Thursday at Citi Field and I bumped into a MASN cameraman on my way in. Did anybody see my back in the introduction? I was wearing a red Nats jersey which read "ROOSEVELT" and number "26". The guy to my right was wearing a gray road Stephen Strasburg jersey. And he's wearing an orioles jersey. At least that should make one poster here happy. Did the Nats office ask and get turned down? BTW, we have Caps fans that come from PA, MD, WV to games on weeknights during the season. I'm not surprised that Leonsis is trying to increase his TV audience. More income from his cash cow means maybe he can improve the Wizards.... maybe. I think the last time Morse had a day off, he came back en fuego. 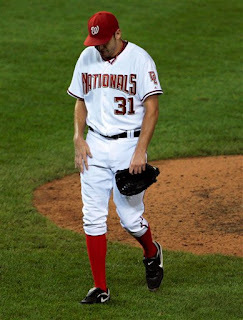 Probably wants both of them back and fresh for Strasburg's start. Debbi Taylor's nose looks like a potato that was dropped from the roof of a 12 story building. You crack me the freak up. Welch was at the game too. Don't get me lying. I recall seeing a Roosevelt jersey but that may have been during the President's Race AKA "The Main Event". Orioles (or Ravens) ARE Washington teams. Boni hitting .283... where was that when he was playing for the #Nats? Why is it so difficult for us to beat this team, this otherwise terrible team??? It defies reason!